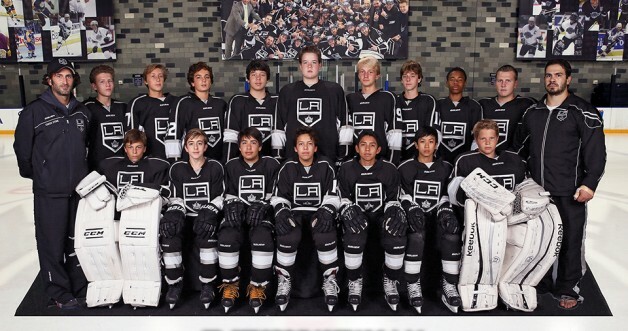 The Los Angeles Jr. Kings’ Bantam AA1 team qualified for the upcoming USA Hockey National Championships after finishing runner-up in its division at this year’s California Amateur Hockey Association (CAHA) Tier II State Tournament, which was contested last weekend (March 13-15) at Iceoplex-Escondido. The Bantam AA national tournament will run from March 26-30 in Salt Lake City, Utah. The Jr. Kings opened the double-elimination state tournament with a 6-3 loss to Golden State Elite Eagles 2 on Friday. Proving its resolve all season, though, L.A. staved off elimination on Saturday by downing the Capital Thunder, 6-1, and exacting revenge over the same Golden State Elite team, 5-3, to advance. Against 2-0 Orange County Hockey Club 1 on Sunday, the Jr. Kings put forth a gutty effort but fell, 4-1, to finish second in the division. With only four players back from last year’s Bantam AA2 team, the Jr. Kings opened their CAHA season with a 1-1-1 mark. After building familiarity as a group, both on and off the ice, the club went on to forge an impressive 12-0-3 mark in CAHA play to finish second in the 19-team division. And Stone is looking forward to seeing what his club can accomplish in Salt Lake City. For more information on the Tier II state tournament, visit CAHA.com. For more information on the USA Hockey National Championships, visit Nationals.USAHockey.com.